Blogging about whole health, lifestyle, real food & nutrition, herbal remedies, natural approaches to managing pain, illness and disease, and tapping into your unique power of intuitive healing through knowledge, wisdom and connection with spirituality. Pick up a bunch of fresh sage, hold it close to your face and inhale deeply .... mmmm intoxicating, isn't it? With its luscious scent and bold flavour, this aromatic herb has been a culinary favourite for hundreds of years. The smell surely conjures memories for you. Are they of Thanksgiving and Christmas? Treasured family gatherings? And by association, a sense of family, love and belonging? Perhaps it evokes indulgence or abundance. Did you know that this wonderful herb also has incredible medicinal qualities? Salvia, meaning 'savior' is the botanical name for Garden Sage. It belongs to the mint family. If you know the benefits of mint, you will notice how similar their healing properties are. As with all mints, Sage contains high levels of calcium and bone-building minerals, along with exceptional vitamins and antioxidants. Wherever you find Sage growing (China, Japan, India, Europe, America) you will find traditions of people using it as a preservative and seasoning for fatty foods as well as a medicine for a variety of ills. They may not have known the science, certainly not the terms antimicrobial or antibacterial, but they knew that it prevented their food (typically meats) from making people sick. And it is from their trials and errors that the wisdom of its many other health benefits have been passed down through generations. Which Type of Product to Use? As fresh leaves, living plants to prune as needed, fresh flowering parts, dried leaves and flowers, as well as oils extracted from the flowers and stems. While these tinctures and extracts are readily available today I find that they are too concentrated. The concentration of medicine in those small bottles is too dangerous for households with children or for general use. Fatal accidents have occurred, play it safe and avoid their use. I recommend staying as close to the way nature gave it to us as possible - that means simply using the leaves, flowers and stems in food and drink. Spring is here, start growing your own bounty! If you have a garden, or a windowsill with room for a potted plant I highly recommend growing your own sage for year round use. It is a very easy to maintain perennial, so you will not need to replant it after the winter. In fact it is such a hardy herb that it will often live right through the worst winter weather, just brush off the snow & continue to prune. The other option is to prune it all back in the fall and either dry your crop for use over the winter months, or make Healing Sage Honey. For culinary and medicinal use you want to ensure that you use only Salvia Sages, see image 2 above. These Sages have pebbly-fleshed ovate leaves. Artemisia Sages on the other hand have white hairs on the backs of the ferny leaves, you may recognize this one more easily as it has an appearance much like White Sage (photo 1). These Sages are usually sold as a "smudge" herb (that is, an herb used for cleansing or protecting a home/space from unwanted or negative energy by burning it). White Sage is actually a Salvia Sage but it is too strong for use as a food or medicine. 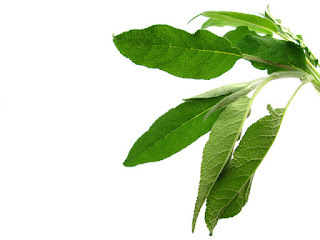 Here's the easy part: the simplest way to use Sage as a medicine is to drink a tea of Sage leaves. If you will be using fresh sage use a handful of leaves and stalks. Let it brew for about five minutes. For those of you making your tea with dried sage you only need 1-2 teaspoons. Crumbled leaves work best, ground sage can be difficult to make tea, but if that's all you have, just stir it directly into the boiled water in your mug. Either method of dried Sage tea only requires brewing of about 3 minutes. Fresh sage tea is not likely to be bitter, but you can certainly sweeten or enhance the flavour if you prefer. Some of my favourite ways are: add a teaspoon of raw honey, or a slice of lemon, fresh ginger root or peppermint. Try out various combinations to see what works best for you - remember even raw honey is high in sugar and has a tremendous impact on the functioning of your taste buds and your bodies ability to recognize hunger - limit its use. Another tasty way to use Sage is to make Sage vinegar: Simply pour room temperature apple cider vinegar into a jar filled with chopped fresh sage. Close the jar and let this infuse for 2-3 weeks. 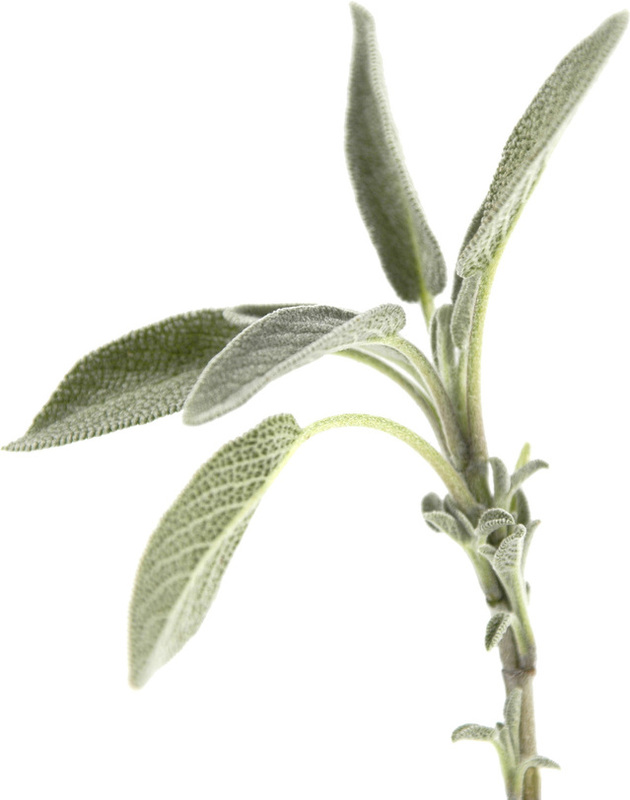 Strain the vinegar into a clean jar and use the sage in a soup or stew, freeze any unused chopped sage for later. The vinegar is not as medicinal as the tea but, added to some olive oil and a few other herbs and spices, you have a delicious and nutritious salad dressing. Here's some food for thought: It is said that just 2 tablespoons of apple cider vinegar every day can reduce your risk of adult onset diabetes by half. And ancient wisdom says "Why die when the Savior grows in your garden?" ... So, two tablespoons of sage vinegar daily might just keep you alive forever. If you think you are in need of more intense therapy than these recipes and dosages provide, please drop me a line to discuss your personal situation. Please remember that anyone who is taking any kind of medication should consult their health care professional before using herbs for medicinal purposes. Certain contraindications exist and unwanted reactions can occur. Please share this post freely on Social Media, or by email. Drop me a line to share your experience with Sage or another medicinal herb. Green Blessings ... I leave you with the wonderful Susun Weed to teach you how to make your own Sage honey. At the end of summer when tomato harvests are overflowing, or whenever your local grocery store puts trays of over ripe tomatoes on clearance - make this vitamin C rich, low calorie family favourite. If you've ever had a few tomatoes that you forgot about sitting in your vegetable crisper - this recipe is for you! Don't let them go to waste, create a yummy and healthy snack! If you are going to go buy the ingredients for your homemade Bruschetta topping - Please consider buying Ugly Produce. It's simple really - don't discriminate & don't waste. Farmers have put time, energy and resources into growing vegetables for us. 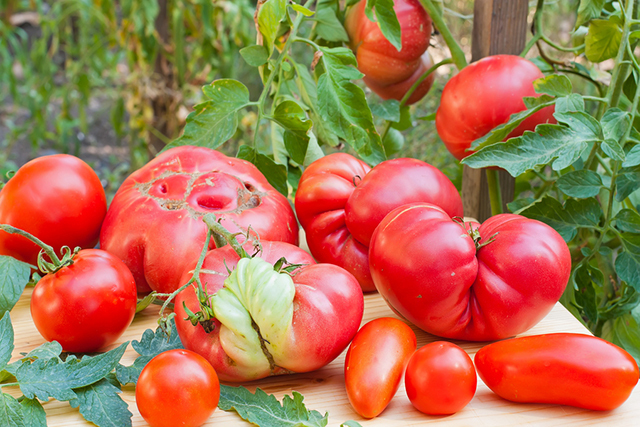 #UglyProduce is just as nutritious & delicious. Best of all, no one will no what the original fruit or vegetable looked like once you've worked your home cookery magic! It's so easy to make - as long as you can stand waiting for it to develop it's beautiful flavours. (If you can't, you're not alone, we've dug into it many times as soon as we finished chopping. Our favourite recipe is the one below, I've developed it over years of trial and error. We really like the red pepper in it, but have made it with green, even jalapenos, I've made bruschetta - pesto fusions when the basil in the garden when wild one year, and we've eaten it as an appetizer, and as a side dish. If you haven't made this before, try out my recipe, tweak it and make it your own ... and please, let me know how it turned out. Are you a Bruschetta aficionado? Do you opt for tradition, or do you mix it up? I'd love to hear your food stories. 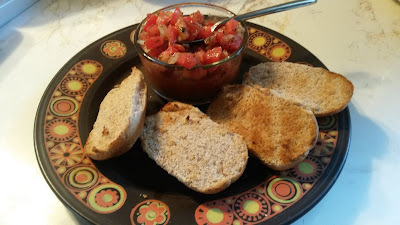 You can serve it over whole grain toast, rolls, garlic bread (truly this is the 'Bruschetta' part of the appetizer, not the tomato topping). Bruschetta (Italian pronunciation: [bruˈsketta] ( listen)) is an antipasto (starter dish) from Italy consisting of grilled bread rubbed with garlic and topped with olive oil and salt. Variations may include toppings of tomato, vegetables, beans, cured meat, or cheese, a popular dish is Bruschetta pomodoro; the most popular recipe outside Italy involves basil, fresh tomato, garlic and onion ormozzarella. Bruschetta is usually served as a snack or appetizer. In some countries, a topping of chopped tomato, olive oil and herbs is marketed under the bruschetta name. You could dip into a bowl of it, or spoon it onto tortilla chips (the scooping doesn't work too well). Or toss it with some freshly cooked al dente pasta and serve either hot with some Parmesan or cold as a salad, either way it compliments pasta perfectly. - Very Easy to make, but a bit messy. - Start by chopping the onion and garlic very finely, then the red pepper - also quite fine. - Now to chop all of those tomatoes, 1/4 inch cubes is the goal, but don't worry about perfection - no one will be focusing on that, they'll be too busy enjoying the taste! - Drizzle with olive oil & the juice of 1 lemon. Stir it all up - I know, it's smelling delicious already. - Now add some or all of the white vinegar, if you prefer use balsamic or apple cider. How much you add will depend on how much juice came out of those tomatoes. You want to have about a total of 1 cup of liquid for this amount of tomatoes. - Now, the hard part .... cover your bowl with plastic wrap, put it in the fridge, and leave it until tomorrow. - If you make it early in the morning, it would be good to go for dinner, but you definitely want it sitting for at least 5-6 hours. This will allow the lemon juice, tomato juice, vinegar and salt to work their magick. They will pull out rich flavours from all of the ingredients, making this your new family favourite! Looking for great Plant Based Recipes? Look no further than Vega's Recipe Blog. Their commitment to Real Food & Real Ingredients not only resonates with me personally, it aligns with my goal of sharing only true, earth friendly, body friendly recipes and food products. Vega Store for Vega One, Vega Protein, Vega Bars and more! Plus you'll receive free shipping on all orders over $100 . Here's a sneak peak of this super easy recipe. For more information, just click anywhere on the recipe (image below) to be taken to the Recipe Blog at www.myvega.com. These Real Food Plant Based Protein Bars are my favourite products of all! So easy to keep on hand for those days when you are running late, but don't want to compromise your commitment to healthy eating - and the Kids will LOVE them too! Dinner last night was a vitamin rich vegetarian soup full of vibrant flavours. It was so easy to make and inexpensive that it's sure to become a family favourite. I added red lentils into the mix to make it a complete meal, served with a toasted whole grain roll. If you like, you can personalize this to your family's tastes by adding toppings such as croutons, fresh herbs, roasted nuts, bacon bits ... the possibilities are limited only by your imagination. Please share a comment or a photo if you try this recipe. 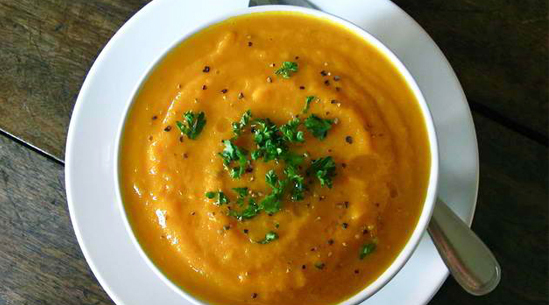 A Bright & Tangy Vegetarian Delight! Peel & Roughly chop all vegetables. Saute onion, garlic & ginger in 1 tbsp Olive oil, add spices once softened then lentils. Toss to coat. Add carrots, lemon, broth, water & remaining 1 tbsp of olive oil. 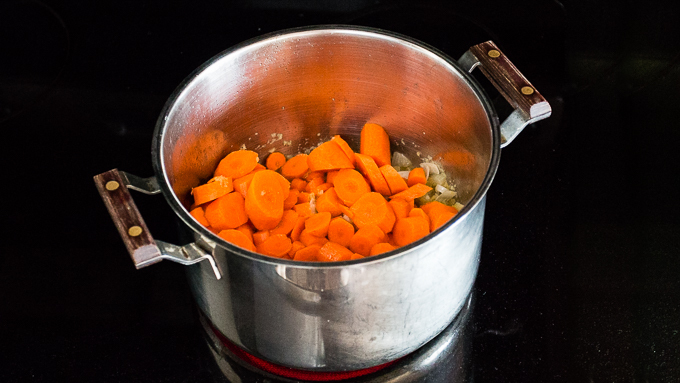 Bring to a boil, then reduce to a medium simmer for 40 min to 1 hour (until carrots are very tender). Puree by hand blender, in a blender or food processor (in batches) return pureed soup to pot, stir in yogurt. Remember to follow me (blogger, G+, or Twitter) for more nutritional news & easy delicious recipes! 40% of Food Banks offerings are fresh food! copyright 2016 Teresa M Wright. Simple theme. Theme images by TommyIX. Powered by Blogger.